New pilot programme: In 2016 Kwa Wazee introduces universal pensions in two villages of the Muleba District. Towards the end of 2003 the Tanzanian NGO Kwa Wazee started to support older people by means of social pensions in a number of wards of the Muleba District. This was the first time in Eastern Africa that the concept of non contributary social pensions for older people was applied. Kwa Wazee understands itself as a small laboratory in developing and testing various approaches to protect and empower older people and their dependents. Over the years cash transfers were gradually complemented by a health programme and by the promotion of various forms of self organisation of older people. 2016 around 1,300 older people headed households were supported with pensions and supplements for vulnerable children in their care. As a consequence of our own evidence and experience and of the current debate on social pensions, Kwa Wazee started a small scale pilot with universal pensions in the Muleba District. Since November 2016 every older person who is 70 years old or older and who has lived for at least five years in one of the two villages, Ikondo and Nsisha, receives a pension of 15,000 TZS every month. The scheme is implemented by local Village Pension Committees, which have been elected by older people's assemblies in both villages. Kwa Wazee provides the funds and is responsible for training and for monitoring. While the various positive impacts of social pensions for older people have been well documented in national and international studies – indeed in several Kwa Wazee studies – the pilot scheme is ambitious to extend the knowledge in areas which have been less examined. 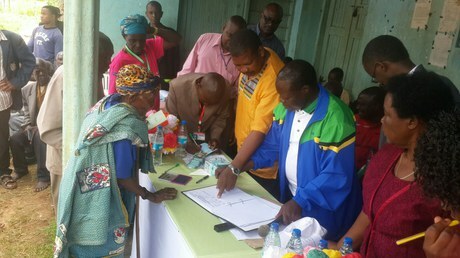 One key objective of the pilot is to learn and to inform stakeholders about numerous practical aspects of the implementation of a universal pension scheme in rural settings in Mainland Tanzania. • How reliable are local data and various forms of ID for the registration process? What are the gaps and how can they be bridged? • How can older people who are especially vulnerable through disabilities or remote locations be reached and by which forms of cash transfer? • How can older people themselves be included in the various processes of the pension scheme? Part of the pilot is a baseline survey which allows for periodic monitoring of developments and changes. The survey also sought new insights on impacts of pensions where little evidence exists so far. It also explores issues like the health condition of people over 70 years, their sense of safety and of agency within their community. Here are some first results.